The mash can be made ahead of time and then reheated in the microwave. If you wanted to make the mash extra special, add some cream and parmesan cheese. For the mash: boil the cauliflower in boiling water until very soft (10-15 mins). Drain well. Mash with a potato masher and season to taste. Set to one side. For the fish: combine the salmon with the tomatoes, balsamic, garlic, sugar and juice in a container. Toss to coat. Marinate for 30 mins to 2 hours, turning occasionally. Heat an oven to 150 degrees C. Place the zucchini on one side of a roasting pan and toss with olive oil and pepper. On the other side of the pan, place the fish and cherry tomatoes. Do not coat with the excess marinade at this stage. Roast for 5-6 mins. Remove from the oven, turn the fish and toss the veges. Now, ladle the marinade over the fish and the tomatoes. Return to the oven a further 2 mins. 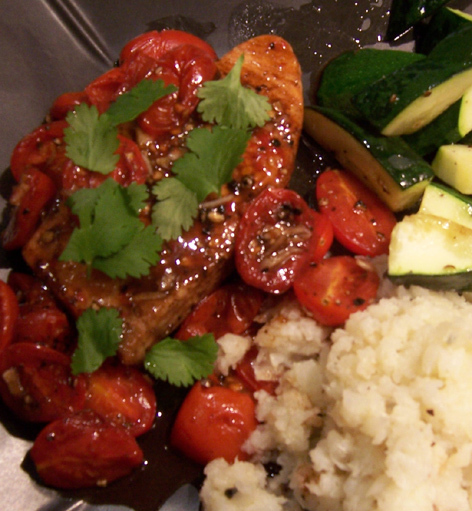 Serve the tomatoes and reduced vinegar as a sauce for the fish, with zucchini and mash on the side. Serves 1 as a main course. Calories: approximately 300. This dish is rich yet flavourful. Serve it with a full-bodied red wine. A recent delight that has caught my fancy is the Richmond Grove limited edition 2002 Shiraz. A real beauty at approximately $20 per bottle. My first attempt at cooking with Moroccan flavours. No idea how authentic this is, hence the name “Moroccan-style”. This is rich with flavour and colour and the almonds give a lovely crunchy texture to the soft eggplant. First, toast the almonds until just brown and crunchy. Set to one side. Heat some olive oil in a frying pan and fry the chicken for 2-3 mins or until just browned. Remove and set aside. Heat more oil and fry the eggplant, allowing all sides to brown and the pieces to become soft, approximately 10 mins. Remove and set aside. Gently fry the onion and garlic until soft. Add the tomatoes, spices and chutney. Season with salt, to taste. Return the eggplant and chicken to the sauce and cook a further 2 mins. The sauce should be thick and rich in colour. Serve immediately with couscous. 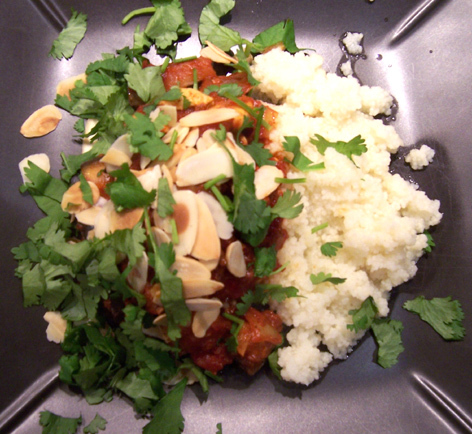 Top with fresh coriander leaves and toasted almonds. Serves 1. Calories in this dish are approximately 400, not including the couscous. Oh I just adore fish, and I love ginger. So this seemed like a natural combination. I used shark in this dish, which, to be honest, was a little lacking in flavour for my liking. The dish still tasted great, but I’m not sure how much of that can be credited to the fish! So ask your fishmonger for a firm, white fleshed fillet that suits Asian flavours and you won’t go wrong. The pak choy in this dish could be easily substituted for any other green leafy veg: eg broccolini or spinach. Just adjust the cooking times as necessary. Steam the pak choy (or other greens) till just barely softened. Remove and set to one side. In a wok or sautee pan, warm 1 teaspoon of vegetable oil plus 1 teaspoon of sesame oil until smoking hot. Add the garlic, ginger and fish and quickly stir-fry, ensuring all of the sides of the fish are browned. After approximately 1 min, remove from the heat. Add the stock, soy sauce and sugar and stir to combine. Add the vegetables and stir again. Return the pan to the heat and stir for a further 20 seconds to warm the dish through. Serves 1 as a main course; 2 as a starter. Calories in this dish are approximately 300 per main course serve, which includes 1/2 cup of steamed white rice. This fabulously healthy yet flavourful dish deserves a wonderful wine to accompany it. If you prepare this dish in the summer then a white wine would be amazing with it. But in light of it being winter here right now, I wanted something red, so I went with a Pinot Noir – The Innocent Bystander 2005 release, which made a lovely accompanyment to this meal. Char Sui is a traditional chinese style for cooking pork. Normally belly pork is used and it is cooked over low heat (or in the oven) for hours and hours. I have modified it to use a lovely cut of pork – the “continental” chop. The chop is marinated for 30 mins, then pan-seared, then finished off in the marinade which simultaneously reduces to give a sauce. The flavour of the pork is so strong it needs a light accompaniment. 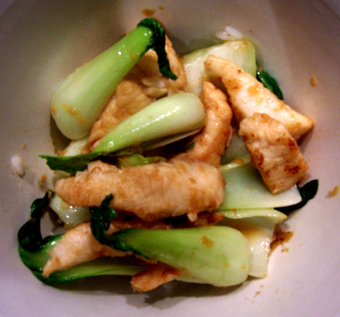 My affection for Pak Choy is no secret – it works beautifully in this dish. Combine everything except the pak choy in a marinating dish. Combine and coat the pork well. Marinate for 30 mins to 2 hours, turning occasionally. Heat a pan to very hot. Sear the pork chop for 1 min on each side. Remove pan from the heat and allow to cool for 2 mins. In the mean time, begin steaming the pak choy over mild heat. Return the pork chop with the marinade to the pan and cook over low heat for approximately 5 minutes or until the pork is just cooked through and the sauce has reduced to a thick, syrupy consistency. If the sauce becomes too thick, add a little more soy and cooking wine. Once the pork is done, the pak choy will also be ready. 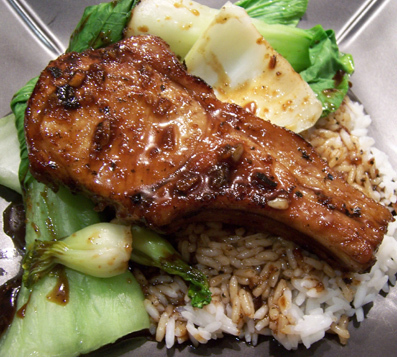 Serve the pork chop over steamed white rice with the pak choy on the side. Serves one as a fabulous main course. Calories: approximately 400 (including 1/2 cup steamed white rice). This dish is SO flavourful, it needs a really strong wine to accompany it. I had a lovely Shiraz Viognier from Langmeil with mine and it was perfect. The acidity of the wine cut through the heaviness of the pork and the spice of the pork really brought out the richness of the wine. Heaven. A low calorie, low fat version of a classic. Make sure you get the fat reduced cream and please, use homemade stock for this, it’ll make all the difference! In a sautee pan, fry the garlic in a tiny bit of olive oil until just softened. Add the mushrooms and stock and cook over gentle heat until the mushrooms have softened and the stock has reduced by half. Season with salt – it will need quite a bit so don’t be afraid. Add the cream and spinach and continue cooking another 1 min. Add the pasta in and stir well to combine. Season with tonnes of cracked pepper and more salt if needed. 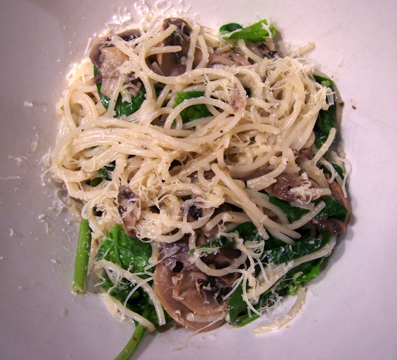 Serve immediately with grated fresh parmesan. Serves 1 as a main course; 2 as a starter. Calories: approximately 300. Shredded chicken breast would be a lovely addition to this dish if more protein is desired. Serve with a crisp white wine. In a roasting pan, place the beet and sweet potato. Coat in olive oil. Roast at 150 degrees C for 20 mins. In a sautee pan, fry the garlic in a little butter or olive oil until soft. Add the fig and continue frying until the fruit starts to swell. Add the red wine, stock and juice and simmer uncovered until the sauce is almost reduced. Turn the heat off, place the lid on the pan and set to one side. 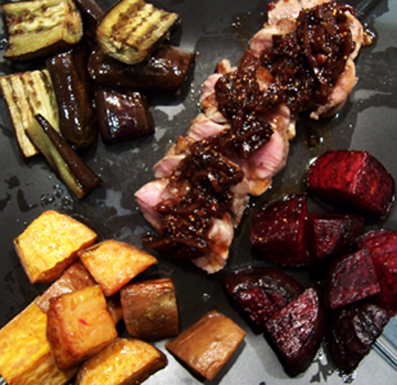 Remove the roasting pan from the oven and add the eggplant and pork fillet. Stir to coat with oil and return to the oven for a further 10-12 mins. To serve, slice the pork fillet and arrange on a plate with the veges. Top the pork with the sauce and serve immediately. Serves 1 as a main course. Calories in this dish: approximately 250. A big, bold, fruity red wine would go beautifully with this dish. Something like a young Cabernet blend would be perfect. 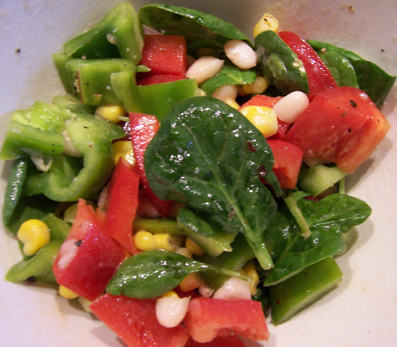 This is a perfect lunchtime salad, whether its a working day or a lazy day. It can be whipped up in minutes and is delicious and nutritious. I buy canned cannilini beans and then freeze away 1/4 cup portions just wrapped in cling film. To defrost them, just leave them at room temp for 15 mins. Combine everything in a big bowl. Season with sea salt and lots of fresh cracked pepper. Dress with lime and olive oil. Serve immediately, or will keep very well for up to 8 hours. Serves 1 as a main meal or could be served as a side salad for 2-4 people. Calories: approximately 200. Add some avocado to increase the cals if you like.